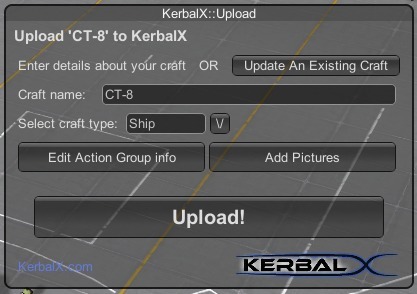 Uploading craft to KerbalX is now even easier! 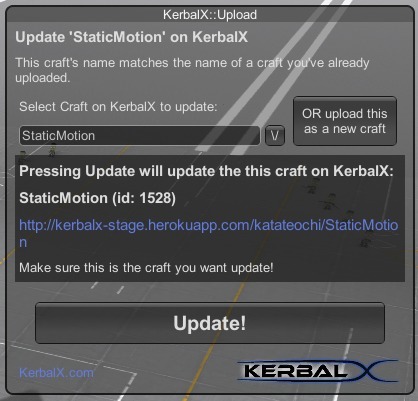 The KerbalX mod lets you upload and update your craft from within the game in a few clicks. It also enables downloading craft from any device and having them delivered to your game. Craft Manager is now the offical mod for KerbalX. From here you can set the craft's type (Ship, Spaceplane, lander etc), add pictures and set info about the action groups. You must add at least one picture! Pictures can be selected from your KSP screenshots folder and will be uploaded to imgur for you, no need for you to upload them yourself. Once you've added a pic or two and set info about the action groups (optional), click upload and your done. Your craft will be posted on KerbalX! When you click Add Pictures an image selector will open and display thumbnails of the pictures in your KSP screenshots folder. Click on the ones you want to use and they'll appear in the upload interface window. 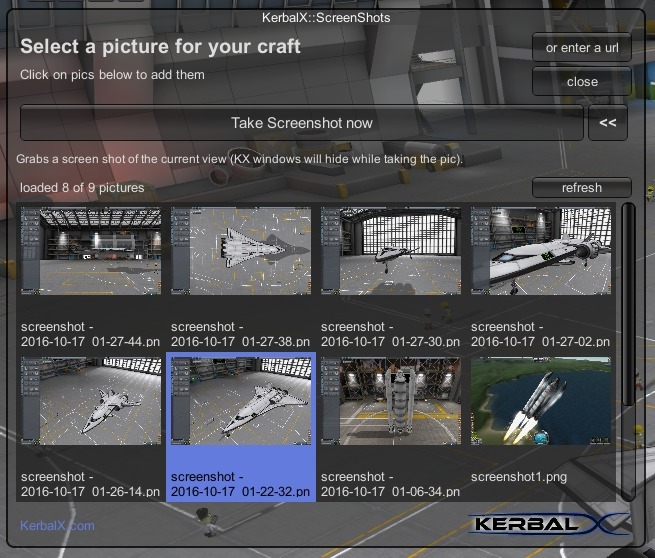 If you don't yet have a screenshot of the craft you can click "Take Screenshot now" to snap a pic of the craft in the editor (the KerbalX windows will hide while taking it). To make it easier to angle the camera for the right shot click the << button and the image selector will go into mini mode. One of the planned features is to enable you to authorize KerbalX to post pictures to your own imgur account so pictures uploaded by the mod will go into your imgur account. If you load a craft which has the same name as one that you've already uploaded, the upload interface with automatically switch to update mode. All you have to do is hit Update! If you have several craft with the same name it won't auto-select one, you will need to pick which one you want to update from the drop down list (all drop down menus are filterable, just type into them to reduce the list). If you wanted to upload this craft as a new upload rather than updating an existing craft you can switch back to upload mode by clicking the button in the top right. Similarly, if you want to update an existing craft which has a different name to the one you've loaded, you can switch to update mode and manually select the craft you want to update. You can also download craft using the mod using a feature called Deferred Downloads. If you use the mod and switch on Deferred Downloads in your settings, when you click download on a craft on the site it won't download right away. Instead craft will be added to your downloads queue. 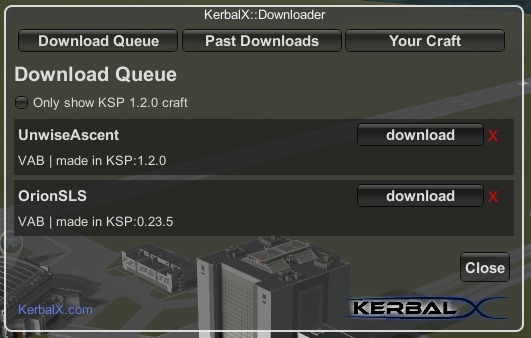 When you next come to play KSP the mod will check your downloads queue and enable you to fetch the those craft directly into your game. This enables you to browse KerbalX on any device (ie your mobile or work computer, ahem) while you're away from KSP and tag craft for download. When you next start KSP you will get a notification in the space center scene to view the craft you tagged and then choose to download them directly into the game. Hit download to fetch the craft or click the red X to remove the craft from your download queue. The download queue is another hangar like your favourites or downloads hangar. From the download interface you can also access your own craft and all the craft you've previously downloaded (those in your downloads hangar). When you create a fresh save the KX mod will ask you if you'd like to fetch your craft from KerbalX and put them into the new save. You can either auto populate the save, in which case it will fetch all your craft for the current KSP version, or you can pick which ones you want. Or you can just dismiss it, it will only ask this question when loading a save which doesn't have any craft saved in it. If you want to use the KX mod in multiple installs of KSP; login in one of your installs, then copy the KerbalX.key file into each of your other KSP installs. Otherwise you will need to enter your login details each time you switch KSP install (as loging in in one will effectively end your session in other instances). When you upload a craft using the KX mod it will also include info about all of its parts. In the case that the KerbalX knowledge base doesn't recognise a part on the craft it can get the required info from the uploaded part data. This means that all craft uploaded via the mod will have all their parts detected, and in the case of your upload resulting in unknown parts being added to the knowledge base you're helping expand KerbalXs knowledge base. When you login to KerbalX with the mod you provide your username (or email) and password (just like a regular login on a browser). If you're authenticated the mod gets back a token which it stores in the root of your KSP install (KerbalX.key file). From then on this token is what's used to authenticate you with the site. Aside from your username/email and password used in the initial login, no personally identifiable information is transmitted or collected.